I’ve been asked to write a new post to this blog, and I’m wondering what to write about. 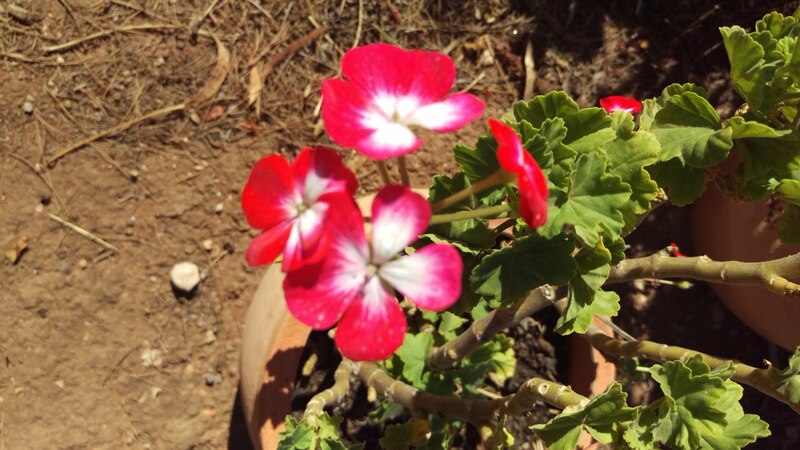 Given the title of this Blog, I should perhaps write something about the garden, or the dogs. The issue with those things are these: The garden is outside, and it’s horrible and hot and humid outside, and I like to stay coolish. I can say this though – the hanging pots, that I can see if I look outside, are looking lovely. Graham does a great job of keeping everything watered, and Nature does a great job too, of keeping the flowers blooming and the leaves green. The dogs, hmm, what could I say about the dogs… At the moment, I only know where two of them are, and that’s asleep, one on the ‘dog’ sofa, the other in her crate. Oo, I just saw another dog, she’s outside, by the back door. No, she’s disappeared again. The curtain that keeps out the sun’s heat also hides the backyard from me. No, bang! there she is, Ananka leapt at the door in her usual way, so I’ve just let her and her daughter, Missy, back inside. The Schnauzer, Nena went out when I let those two back in, and Lah Dee went out with Nena. Lah Dee is Ananka’s son, from her first litter of pups, Missy is from her second and final litter. 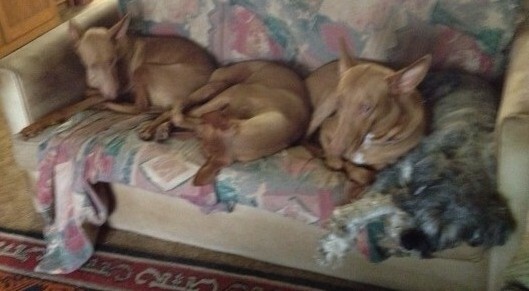 They’re all Pharaoh Hounds. So now I have Nena waiting at the back door, and a woof, ‘It’s hot out here!’ So I’ll let them back in again. Done. Now we have all four dogs back inside, and the garden outside, with the sun and heat outside too. The air conditioner is doing its work well, and it’s lovely and cool inside. The heat that tried to come in with the dogs was hellish! But the time went on, the pressure inched up, and the poems arrived in my head and on the screen and then whizzed off to Matt, for his consideration. I got my fifteen poems written and Matt did his Editor thing and eventually all of the poems had arrived and were put together. So there’s a new book of poetry come into the world, and ie will be available to the world at the end of February. Is that exciting? Yes, it most certainly is! I was going to insert a photo here, in fact I did that, but when it appeared on the screen it was upside down, and I din’t think it would be fair to the reader to have to stand on their head to look at it. I’ll look again, or maybe turn the photo up the right way and save it like that. Ah, I fixed it! Yay, no Jake in sight, so I fixed it myself! That’s it, I’m going now. Happy with my computer skills, that I, a nearly fifty year old, was able to do something I usually would ask my 19 year old son to do for me. Hooray for good ‘ol Having a Go! In the photo from the left, we have Ananka, Missy, Lah Dee and Nena.